While the traditional ad coelum doctrine no longer applies to grant property owners airspace rights that extend to the heavens, the Supreme Court in Causby v. United States held that a landowner did own “at least as much of the space above the ground as he can occupy or use in connection with the land.” Thus, drone operators could be civilly liable for drones flying close enough to the surface to interfere with the use of the property owner. 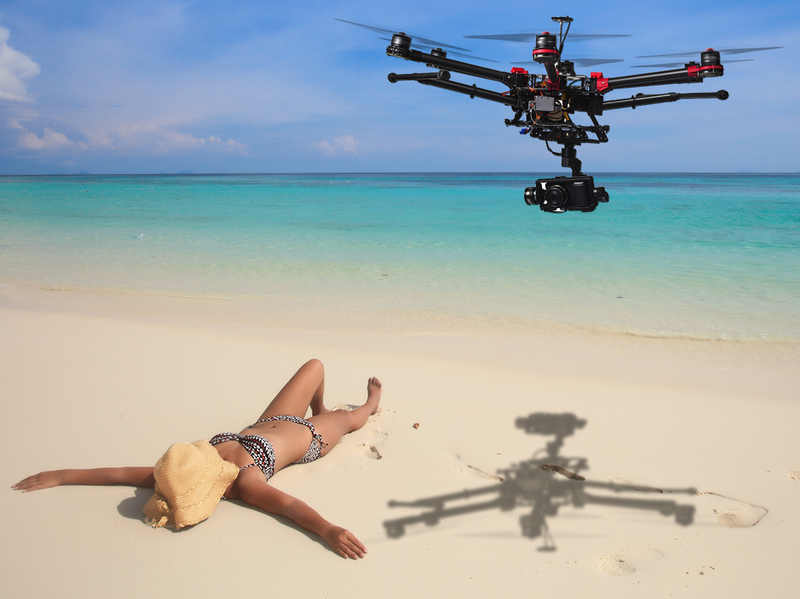 Among the causes of action property owners could bring against drone operators are intrusion upon seclusion and private nuisance. These civil causes of action, however, do not justify property owners in taking destructive force against drones. In fact, property owners taking such force can expose themselves to equal amounts of liability. Primarily, drone operators could bring a cause of action in conversion. To be successful in a conversion action, the drone owner must prove that she: (1) owned, possessed, or had the right to immediate possession of property, (2) the property was personal property, (3) the defendant wrongfully exercised dominion or control over the property, and (4) the drone owner suffered an injury. Shooting down a drone flying over private property would likely meet all these elements and result in damages being owed to the drone owner. Further, even if the drone is not physically shot out of the sky, a perturbed property owner could also be held liable if the drone crashes on their property and property owner refuses to return the drone. Drone owners may be able to recover damages equal to the fair market value of the drone plus interest if a property owner destroys a drone flying above her property. In addition to the civil liability property owners may expose themselves to by shooting down drones, criminal charges could also be incurred in certain circumstances. One of the potential criminal charges that could be brought against property owners who shoot down drones is criminal mischief under Texas Penal Code § 28.03. A person commits criminal mischief when they intentionally or knowingly damage or destroy the tangible property of another. Shooting down a drone would clearly meet these elements and could potentially subject the shooter to prosecution. Another potential criminal charge that could be brought against drone shooters is discharge of a firearm in certain municipalities, or “reckless discharge,” under Texas Penal Code § 42.12. A person commits this offense by recklessly discharging a firearm inside the corporate limits of a municipality having a population of 100,000 or more. In charging someone with reckless discharge, the prosecution must allege something about the setting or circumstances of the firearm’s discharge that demonstrates the shooter’s disregard of a known and unjustifiable risk. In a drone-shooting scenario, property owners living in a residential neighborhood could be charged with reckless discharge because firing a firearm in the sky at a drone would likely meet the required “known and unjustifiable risk” discussed by Texas Courts. Despite these potential criminal charges, property owners may believe that they are justified in using force against overflying drones because the drones are trespassing. A “defense of property” justification to drone shooting, however, is unlikely to be successful in these circumstances as the defense only permits the use of force “to the degree the actor reasonably believes the force is immediately necessary to prevent or terminate the other’s trespass.” When hobby drones armed with nothing more than cameras are involved, it is unlikely that a court would consider the use of a firearm as “necessary” to eliminate the drone’s trespass. This lack of necessity combined with the public policy concern courts would have about the discharge of firearms in residential areas would make the defense of property justification inapplicable. Because disputes over drones are only recently increasing in number, courts have yet to have much opportunity to hear cases on these issues. However, concerns raised by the proliferation of drone technologies are becoming more visible to the legal community with every news story about unhappy neighbors and overflying drones. For example, a court in California recently ruled in favor of a drone owner, awarding $850 in damages, when the defendant shot down the drone as it flew above his property. Similarly, approximately a month ago, a Kentucky man was arrested and charged with wanton endangerment and criminal mischief for shooting down a drone in his residential neighborhood. As incidents such as these grow in number, it is likely that lawsuits will increase in number and District Attorney’s Offices across the state will be more inclined to prosecute cases involving drone shooting. Therefore, when confronted with a drone dispute, property owners should report the drone activity to local law enforcement agencies that may then pursue trespassing charges against the drone operators. If the problem becomes a nuisance or is frequently invading the property owner’s privacy rights, they should consult a lawyer about bringing civil claims against the drone owners. Until the law catches up with the evolving drone technology, self-help, especially in the form of shooting, should be avoided as it could result in civil or criminal charges against the property owner.